It takes just 10 minutes of prep time to wow your family and friends with Tex Mex Cheddar Corn Casserole! My motto this year continues to be healthy recipes that are SIMPLE! But, that doesn’t mean I’ll accept boring…and you don’t need to either! 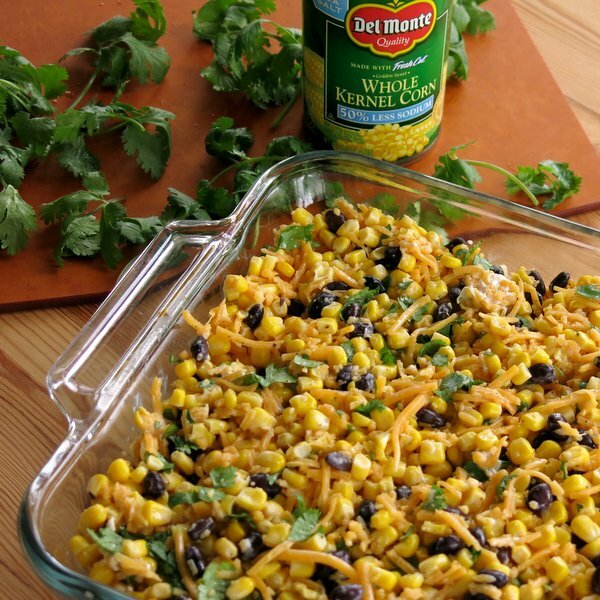 I’m thrilled to be partnering with Del Monte to bring you this Tex Mex Cheddar Corn Casserole Recipe. It’s part of their #10MinuteWow recipe collection which includes recipes that are wow-worthy, tasty and easy to make. Check out all of the recipes on their Easter #10MinuteWow Pinterest Board. You’re sure to find inspiration for your Easter celebration. These recipes are super easy to customize to your families tastes too! 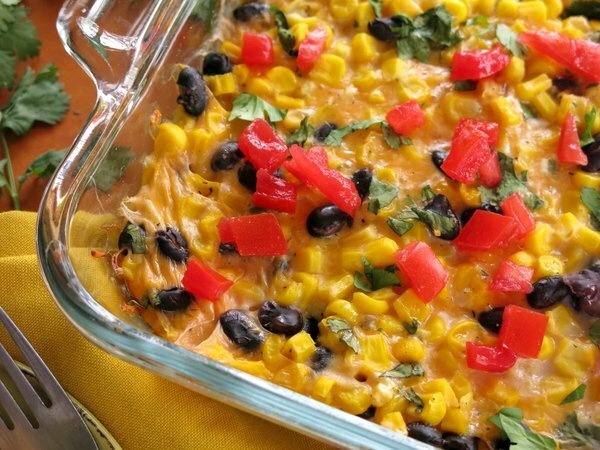 I’m sure it’s no surprise to my dedicated readers that my family fell in love with a Mexican twist to this cheesy casserole. 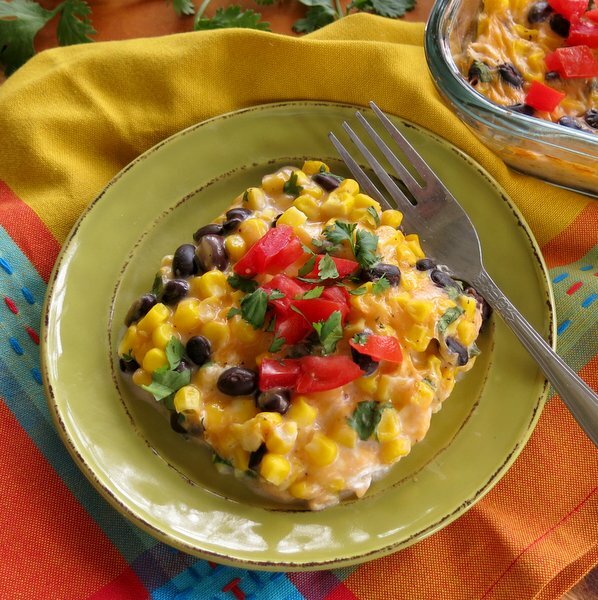 It’s the very first thing that came to mind as I was perusing the recipes because the main ingredients, corn, black beans and shredded cheese, are always on hand. It’s a good bet that there are plum tomatoes on the counter and cilantro struggling to grow outside. 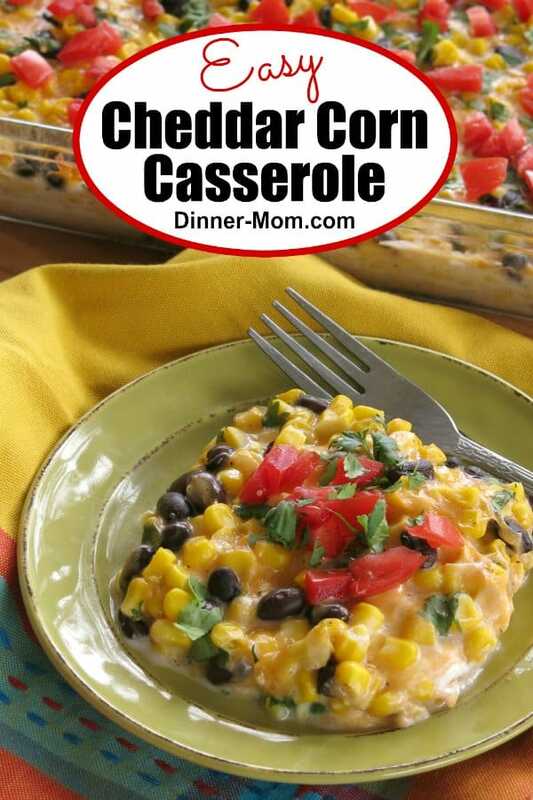 Adding the extra protein turns Tex Mex Cheddar Corn Casserole into an Easy Prep/Hands-Off dinner option. Create your own #10MinuteWow recipes from Del Monte’s #10MinuteWow Easter Pinterest Board. Stay in touch with Del Monte on Facebook, Twitter, Pinterest and Instagram. Please rate this recipe and tag @DinnerMom or #DinnerMom on social media. We love to see what you are cooking up! 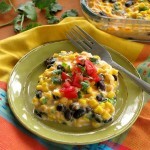 Make Tex Mex Cheddar Corn Casserole and wow your guests! Toss together cheddar cheese, flour and pepper in a medium bowl and set aside. 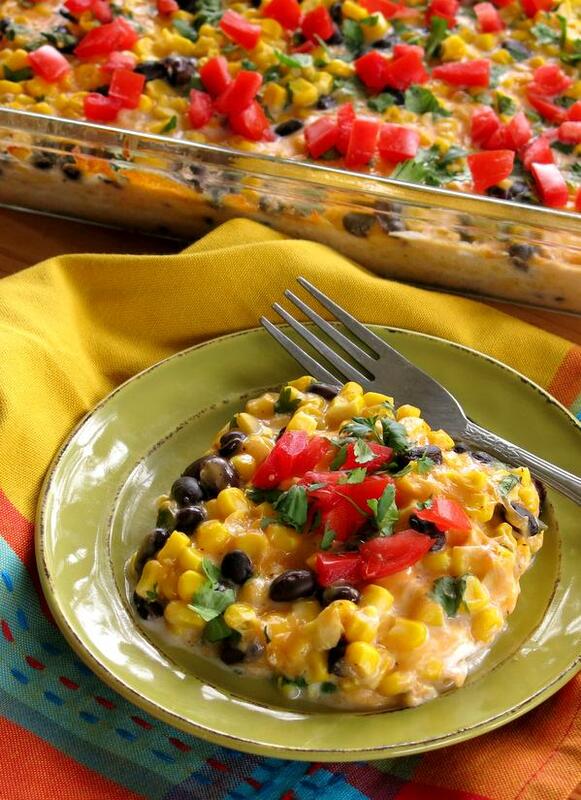 Stir together milk, hot sauce, corn, black beans and 1/3 cup cilantro in a 9x13-inch baking dish. Place cubed cream cheese over the corn mixture. Layer cheddar cheese mixture over corn mixture in baking dish and mix to combine and distribute ingredients. Uncover and bake 5 minutes longer. Top with remaining cilantro and diced tomatoes. This is a sponsored conversation written by me on behalf of Del Monte. The opinions and text are all mine. I think I have everything I need to make this! Looks so yummy! I love corn and love casseroles so this is right my alley. It looks really easy too! I could not be left alone with this. Would eat the whole pan. Easiest pantry recipe ever. I always have corn and black beans and my fam loves this combo! Keeper.